A Polygon Pour being used to create a large GND area on a board. Polygon pours are used to create a solid or hatched (lattice) area on a PCB layer. Also referred to as copper pours, polygon pours are used to fill irregularly shaped areas of a board, automatically pouring around existing objects, connecting only to objects on the same net as the polygon pour. A polygon pour is a group design object - that is, it is made up of simpler primitive objects, either regions, or tracks and arcs. 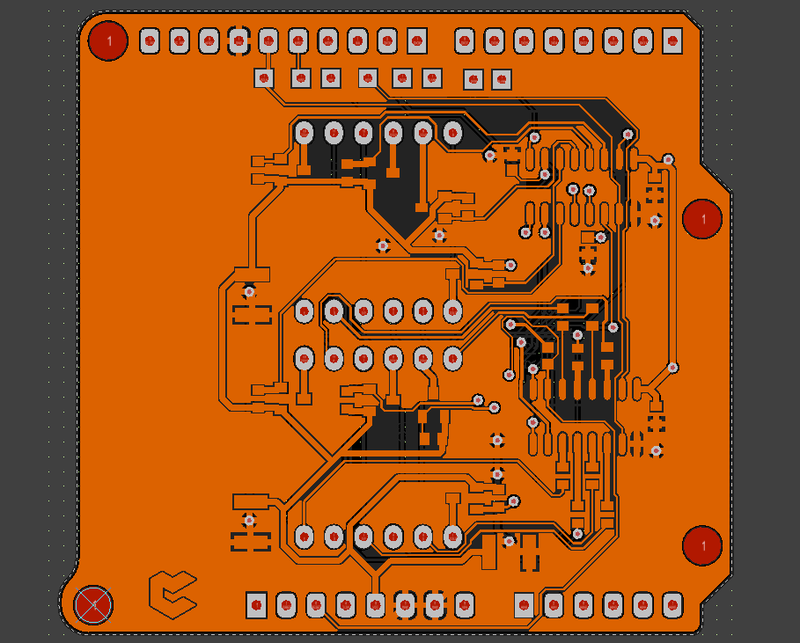 On a signal layer, you can place a solid polygon pour to define an area for carrying large power supply currents, or as a ground-connected area for providing electro-magnetic shielding. Hatched polygon pours are commonly used for ground purposes in analog designs. Switch to the required layer. Click on Home | Pour | (click on the image). Define the properties of the Polygon before placing it. Select the polygon Fill Mode, these are discussed in more detail below. Select the required net in the Connect to Net drop down. Note that each polygon has a Name, a system-defined name will be based on the layer and the net, enter your preferred Name. Typically that is all that needs to be set before placement (the other options are discussed in more detail below) - click OK to commence defining the polygon shape. Position the cursor and click to anchor the starting vertex for the polygon. Move the cursor ready to place the second vertex. The default behavior is to place 2 edges with each click (as shown in the first 5 images in the set below), with a user-defined corner shape between them. Refer to the Placement Modes topic below for more details on changing corner modes. Continue to move the mouse and click to place further vertices. After placing the final vertex, right-click or press Esc to close and complete placement of the polygon. There is no need to manually close the polygon as the software will automatically complete the shape by connecting the start point to the final point placed. The order that polygons are poured (or repoured if you run the Repour All command) is determined by the order they were placed, with the first one placed having the highest priority. Keep this in mind as you place the polygons. Press the 1 shortcut key to toggle between placing two edges per click, or one edge per click. In this second mode the dashed edge is referred to as the look-ahead segment (as shown in the last image in the set below). Press Shift+Spacebar to cycle through the 5 available corner modes, press the 1 shortcut to toggle placement between 2 edges or 1 edge. Track/Arc based polygons allow a hatched polygon to be created, by setting the Track Width to be smaller than the Grid Size. Note that they can also be solid by setting the Track Width to be larger than the Grid Size. Outline Only polygons are simply Track/Arc polygons without the internal tracks and arcs. The same Polygon, poured using regions, then poured using tracks/arcs. Click Home | Pour | and select Define From Select Objects from the menu. The polygon will be created with its Fill Mode set to Outline and the Is Poured option disabled, so it will be an empty polygon. Note also that the original selected primitives are not removed, so the new polygon will not be visible as it's outline lies along the centerline of the selected objects. The selected objects can now be deleted or moved to another layer (via the Inspector panel), to reveal the new polygon. If you find this confusing, another approach is to select the objects to be used, switch to a different layer, then run the Define From Selected Objects command to create the polygon on that layer. Enable Single Layer mode (Shift+S) and you will see the outline of the new polygon. Double-click to repour the new polygon as solid or hatched, and enable the Is Poured option. As the Define from Selected Objects algorithm uses the centerline of the selected objects, it requires that the start and end locations of touching objects are exactly co-incident (at the same location). If this is not the case a Confirm dialog will appear, giving the location where the algorithm failed, and also providing the opportunity to instruct the algorithm to attempt to define the polygon from the edges of the objects instead. As long as the selected objects overlap slightly this option should create a polygon, with the edge of the polygon tracing the outer edge of the selected objects. This method of editing allows you to select any placed polygonal-shaped object directly in the workspace and change its size and/or shape, graphically. All polygonal objects, including polygons, regions and 3D body objects, share the same graphical editing techniques. To select or edit a polygon, first switch to the layer that the polygon is on. Click once to select the object - editing handles (vertices) will appear at each corner, as well as a handle at the center of each straight or curved edge. For a polygon, you must first switch to the layer that the object is placed on to be able to select it. Click and hold on a handle to move it: if it is a center handle (displayed as hollow) you will be breaking the edge, if it is an corner (end) handle (displayed as solid), you will be moving the vertex. To move an edge of the polygonal object, click and hold anywhere along the edge then slide it to the required location. To remove a handle, click and hold on it, then press Delete on the keyboard. The editing technique described above can be commenced by clicking once to select the polygon, or it can also be started by selecting the Home | Pour | Polygon Pour » Move Polygon Vertices command from the Ribbon. This method of editing uses the Polygon Pour dialog to modify the properties of a polygon pour object. Refer to the Dialog Page to learn more about each option in the dialog. To perform design tasks within a polygon, such as repositioning a component or moving routing, the polygon can be un-poured. Unpouring a polygon is performed by clearing the Is Poured option in the Polygon Pour dialog, when this is done the polygon is displayed as thin outline. To repour an un-polygon, click on the outline to select the polygon, then right-click within the polygon and select Polygon Actions » Repour Selected from the menu. Alternatively, double-click on the outline and enable the Is Poured checkbox in the Polygon Pour dialog. Click Home | Pour | and select Polygon Pour Cutout. The cursor will change to a crosshair, starting inside the boundary of the polygon, click the Left Mouse button to define the starting location. Move the cursor across the polygon. The cutout is actually a Region object with the Polygon Cutout option enabled, press Shift+Spacebar to cycle through the region corner modes. Continue to click and move the mouse to define the cutout outline. Right-click to exit polygon cutout placement mode. The original polygon must now be repoured, double-click on the polygon to repour it - it will pour around the new cutout. The cutout exists as an independent object, it can be moved, resized or deleted if required. Remember that the polygon must be repoured whenever the cutout is changed. If attempting to graphically modify an object that has its Locked property enabled, a dialog will appear asking for confirmation to proceed with the edit. 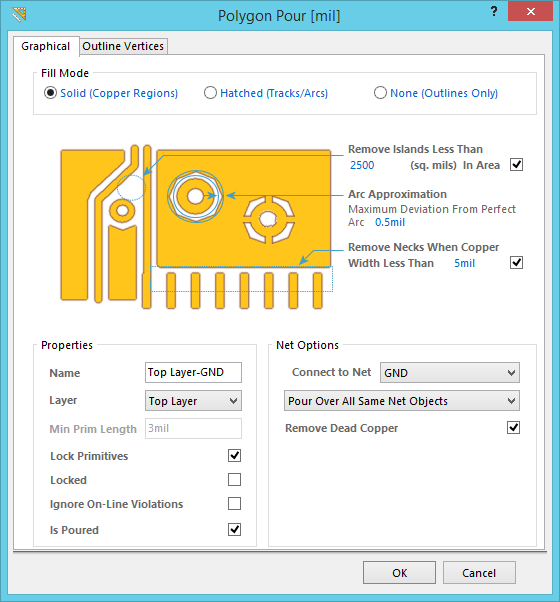 If the Protect Locked Objects option is enabled on the PCB Editor – General page of the Preferences dialog, and the Locked option for that design object is enabled as well, then that object cannot be selected or graphically edited. Double click on the locked object directly and disable the Locked property or disable the Protect Locked Objects option, to graphically edit the object. Polygons are poured in the order they were placed. When the Repour All command is run they are repoured one by one, starting with the first-placed and finishing with the last-placed. Keep this in mind if your design uses overlapping polygons, place polygons in the order you want them to be poured.